With a State Liquor Authority committee meeting slated for Nov. 18, Community Board 3 has now posted the latest batch of liquor license questionnaires to its site. Always an exciting time! Let’s take a look at what’s coming up in the East Village and Lower East Side restaurant world, shall we? (And don’t forget: in addition to all this, John McDonald is turning the former Veselka Bowery space into a steakhouse and oyster bar). Momofuku Ko – 8 Extra Place – Momofuku’s name isn’t on this questionnaire, but David Chang has already confirmed with The Times that he’s moving his tasting-menu restaurant from First Avenue to Extra Place. Here we have some specifics about seating: it’s looking like “4 tables seating about 4 people each, 1 counter seating approximately 25.” Hours will be noon to midnight early in the week, and it’ll be open till 1 a.m. later in the week. Dirt Candy – 86 Allen St. — Is this widely praised East Villager also moving? or just opening a new location? Chef Amanda Cohen declined to comment but in the meantime, it’s clear she has some sort of plans for the Lower East Side. The 86 Allen location would have up to 40 seats and a chef’s counter. Check out the sample menu here. Schnitz – 177 First Avenue – The popular Smorgasburg vendor is opening a 19-seat restaurant serving soups, salads and sandwiches in the former home of Something Sweet bakery. More here. Root & Bone – 200 East 3rd St. — “Rising Star Chef” Jeffrey McInnis, of Miami’s Yardbird Southern Table and Bar, and his fellow Top Chef alum Janine Booth plan to bring “modern Southern cuisine with a focus on ideally sourced ingredients” to the former Mama’s Food Shop space. More here. TBD at 49 Clinton St. — the owners of Yopparai, on Rivington Street, are looking to open a Japanese restaurant in the former Clerkenwell space. More here. TBD – 269 East Houston — A manager of 1849 Restaurant is seeking to open a bar/restaurant in the former Local 269 space. More here. Cantina LES – 8-10 Avenue B – a pair of first-time operators are turning a hardware store into a Mexican spot serving brie, apple and arugula quesadillas and frozen margs. You can peep the preview menu here. TBD at 120 Ludlow St. — Joseph Torres, the operator of Foundation on Essex Street, is, along with partner Raymond Yuk, seeking to bring a bar/restaurant to the former Motor City space. 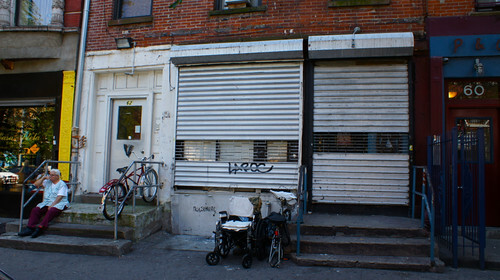 The partners pitched an international skewer spot to CB3 last month, according to the Lo-Down. WhyNot Coffee & Wine – 175 Orchard St. – Emil Stevkof, an owner of Olio, is seeking to bring a location of his West Village spot, WhyNot Coffee & Wine, to the Lower East Side. The menu, which you can see here, consists of pastries, quiches, charcuterie, sandwiches and specialty coffees. The space will host the occasional art shows and live classical violin music.